Three-time British Superbike Champion John Reynolds is aiming to at least finish all four races this weekend at the International Island Classic higher than he qualified, which was thirteenth place – fifth row on the starting grid. The 55-year-old, who stopped the clock with a 1’39.901 in the second qualifying session this afternoon, explained to Bikesportnews.com that his biggest problem was going to be that the fact that he was on slick tyres and only getting a sighting lap before the lights go out. Reynolds at the moment is not prepared to push on new tyres. “We’ll see how we go. I would just like to finish higher than I qualified,” added Reynolds. The Nottinghamshire man has not raced this hard since he retired from professional racing, which was all the way back in 2006. This is why Reynolds right now is finding it hard out on circuit. 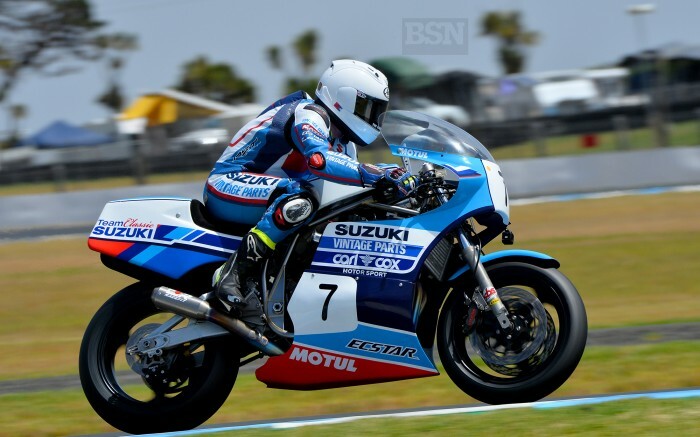 “The Carl Cox Motorsport/Team Classic Suzuki GSX-R is a great bike, but to reach its limits I have to keep pushing and pushing,” explained Reynolds. Apart from that, Reynolds is having blast at the 26th running of the International Island Classic, flying the flag for the New Zealand team. “There are some amazing bikes out here and some great people. I’m very lucky to be working with the Carl Cox Motorsport team. It’s really been something quite special. I just really look forward to going racing now and see how we go,” finished Reynolds. Tomorrow will see two six lap races for the International Challenge, while race three and four will take place on Sunday.